Rick VanMatre is one of the most exploratory saxophonists in the worlds of jazz, classical, and progressive music and has presented solo recitals and jazz club performances in the US, Europe, Israel, Brazil, and Asia. He is widely recognized for bringing a unique, identifiable voice to a variety of genres. In addition to leading his own ensembles with original music, he has performed with such diverse ensembles as the Duke Ellington Orchestra led by Mercer Ellington, the Woody Herman Orchestra led by Frank Tiberi, Roland Vazquez’s contemporary Latin groups, and artists like John McNeil, Tim Hagans, and Gene Bertoncini. Recordings as featured jazz soloist include the PsychoAcoustic Orchestra, the Kim Pensyl Ensemble, the Cincinnati Pops Orchestra, Manhattan Transfer and John Pizzarelli. He has commissioned unique crossover jazz/classical concerti and performed them with orchestras including the New York Repertory Orchestra, Sichuan Symphony Orchestra (China), and Cincinnati Chamber Orchestra. 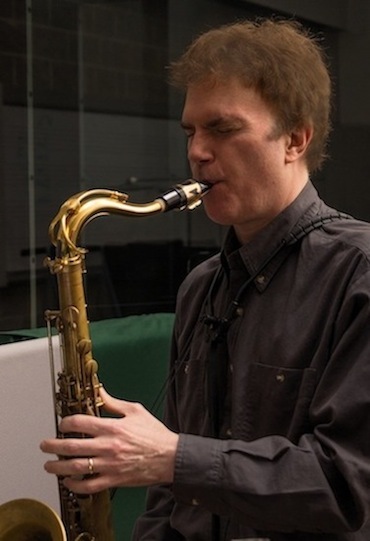 As a classical saxophonist, he has recorded interactive drama/music videos with composer/bassist Frank Proto, has appeared with the Cincinnati Symphony Orchestra, Rochester Philharmonic, Illinois Philharmonic, concert:nova, and James Conlon’s Linton Series. He holds the soprano chair in the New Third Stream Saxophone Quartet, an innovative ensemble combining jazz and classical elements. His collaborations also have included commissions and premieres of unique crossover works featuring art installation, aleatoric computer music, organ, vocal ensemble, Indian music, drama, and multimedia presentations entitled “Earthkind-Humankind” showcasing poetry and dance. He has presented performances and lectures for the International Association for Jazz Education, Music Educators National Conference, North American Saxophone Alliance, World Saxophone Congress, Jamey Aebersold Summer Jazz Clinics, International Summer Jazz Academy in Warsaw, Poland, and for universities, conferences and all-state ensembles in the U.S., Europe, China, Korea, Thailand, and Brazil. He is an Honorary Member of the Sichuan Saxophone Society and the first western saxophonist to serve as visiting teacher and present a formal concert at the conservatory in the Xinjiang Uyghur Autonomous Region of China. He has written for Saxophone Journal, has served as Executive Board Member and Jazz Coordinator for NASA, was President of the Ohio Unit of the National Association of Jazz Educators, and is on the Editorial Board of the Saxophone Symposium. VanMatre has been named “Best Jazz Musician” by Cincinnati Magazine, a “reed titan” by Midwest Jazz magazine, “technically superb and musically inventive” by the Cincinnati Enquirer, Ohio Jazz Educator of the Year by NAJE, and the “Ernest N. Glover Outstanding Teacher” by CCM students. In 2018 he was inducted into the Cincinnati Jazz Hall of Fame. His undergraduate studies were at the College-Conservatory of Music and Berklee College of Music, and he received his MM (Jazz Studies and Contemporary Media) from the Eastman School of Music. Many of his former students are active performers throughout the nation and others hold teaching positions at universities. VanMatre is an endorsing artist for Selmer Saxophones and D’Addario Reeds and performs exclusively on Reserve and Select Jazz reeds.